High school students love learning about diseases through anatomy case studies! This is a great addition to an Anatomy & Physiology, Health Sciences, or Medical Pathology course and the problem-based lessons provide a great example of real NGSS phenomena. 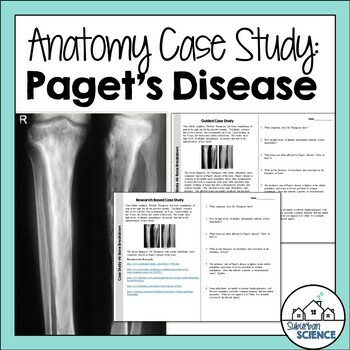 In this case study, students learn about a disorder of the bones known as osteitis deformans, or Paget's disease of the bone. Case studies are perfect for extending thinking on a topic or for use as sub plans. Answer keys are included. 1. Guided Case Study- Students are presented with the symptoms and diagnosis, then led through the related information about the condition. Questions are presented as a reading comprehension-style assignment. This is a great choice for struggling students or as a quick supplement to your unit. 2. 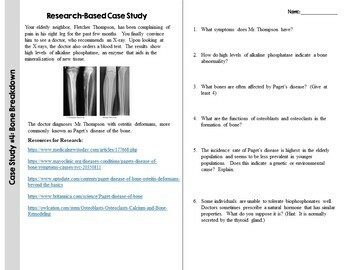 Research-based Case Study- Students are presented with the symptoms and diagnosis. Websites are provided for additional information in order to answer the related questions about the condition. This is a great choice for more advanced/independent students or if you have more available class time. *Please note: To determine if this case study fits with the difficulty-level of your course, please click on the PREVIEW above. If you haven't introduced specialized bone cells to your class yet, you might want to start with my Skeletal System Bundle (includes instructional PowerPoint, Doodle Notes, and Activities). Looking for more resources? See my other Anatomy Case Studies and my Full Anatomy Curriculum!